In 1794 John Ward Hassells prepared his field in the centre of Stoke for building development. The area was laid out with a grid-iron pattern of streets between Honeywall and what is now Campbell Place. The new streets included Hill Street, Market Street (now Hide Street), Thomas Street (now Acquinas Street), Cross Street (formerly Chapel Street, now Epworth Street) and Canning Street (now Poulson Street). In the centre of this new development a square was laid out to accommodate a town hall and market. The drawing of Stoke Town Hall above is by Buckler c.1840 (from the William Salt Library, Stafford). The view is from King Street in front of the Kings Arms public house. 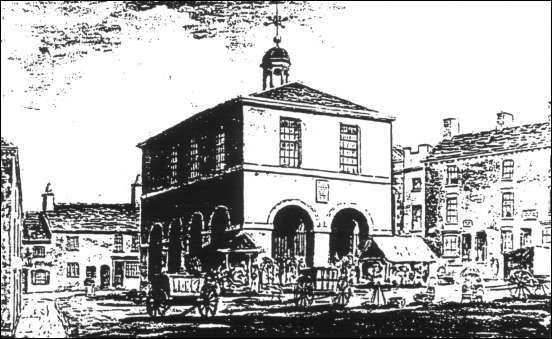 Just visible beyond the town hall on the right is part of the new covered market erected in 1835. A school of art was held in the old town hall - in 1859 this school was moved into the Minton Memorial building on London Road.